Description: Mod#96 resulted in the Big Map being displayed in half-height. The problem with that mod was that it broke the full-sized Big Map when the user hit the 'M' key. It also broke the VERY USEFUL EXPLORE mode which is commonly used in the briefings to scout the target area and to familiarise the armchair bomber with the shape and size of the target. (4) at any Advanced Mission Planner screen, click the Sub-Menu item "Explore" and you will be able pan around the 3D world of the current mission. 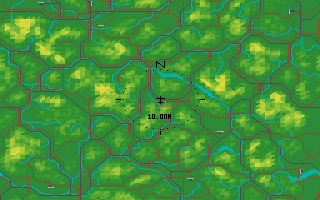 So in effect, I managed to modify the source code MAPVIEW.ASM and MOVEMAP.ASM so that all 4 use-cases are bug-free, and you get the maximum gaming experience when using the Big Map or Half-Screen Map in Tornado. Attached is the latest FLIGHT.EXE file. I will be adding some screenshots in this post later today. Description: One of the key ingredients of Tornado is the excellent Advanced Mission Planner (AMP). Connected with the AMP is the Explore view. Tornado gamers would be wise to use the Explore View to scout out the target area and to make observations of its surroundings. I have done these improvements to the Explore View. 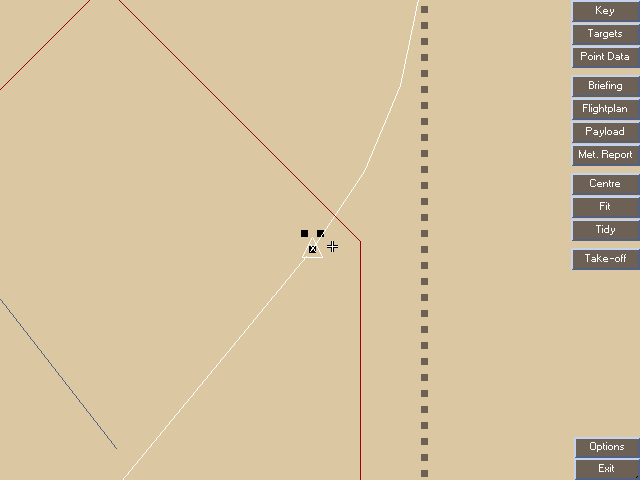 (1) Hit Enter to get an instant directly-looking down view of the spot indicated by the crosshairs a screen ago. Immediately after hitting Enter, in the stock game you had to pitch your view downloads to bear on the target. In this mod, you are start by immediately looking directly down at the target. You can dive down to 16 feet with the Up ArrowKey. Conversely, climb with the Down Arrow key. Scanning the target area, memorising placements and detail. 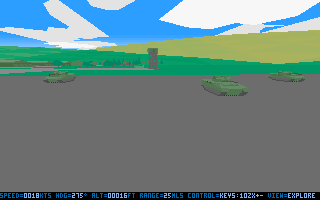 View has been tilted up, but you won't be able to fill the screen with the sky! Pitch is variable, but not a full 360%. Within limits. Use the '1' and/or '0' keys. Attached is the FLIGHT.EXE file. Mod: Added shadow below the Tornado. 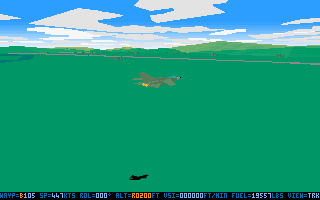 Description: See that shadow below the Tornado in the screenshot below? It really brings out the 3D in the environment doesn't it? It gives the view an extra dimension of depth! Especially the ground. But Digital Integration's Tornado has never had a shadow. And never will unless someone modifies the code to add a variable-angled and variable-sized shadow below the Tornado. Until and unless that happens, this Mod#99 is but a mere dream. So this Mod exists only in an alternate universe. It isn't real. It's just a mock up, but it gives you an idea of WHAT COULD BE! Cruising at 200 feet above ground. The shadow makes a BIG difference, doesn't it? But hey, after one year and a minimum of 98 modifications to the code, I can dream can't I? FLIGHT.EXE not attached because there is none. I don't think I will be completing Mod#99 anytime soon. It will be a mini-project worthy of my humble programming skills. I will, however, require all the help I can get. If you have any knowledge how to do this, please do let me know. As for Mod#100, it remains to be seen. Description: Giving credit where credit is due. 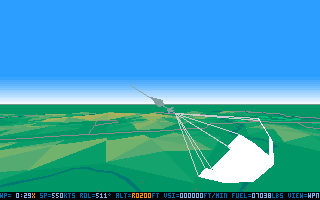 With a polygon count to gauge the load on the PC's CPU in case of any slowdown when running FLIGHT.EXE on a retro 286/386/486 PC. Hit "\" and hold down, brings up the credits (centre screen) and polygon count (top left screen). (4) If the Half-screen Map is active, hit "<" to zoom in. Attached is the latest FLIGHT.EXE. Enjoy. And that's a wrap from me. It has been a great run! 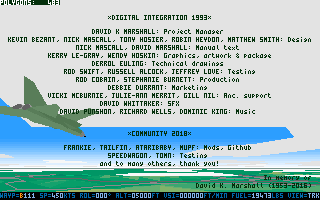 This is the 100th Mod and may Digital Integration's Tornado never be the same again. In fact I think it was already awesome before August 2018, but it is truly fantabulous this September 2018. One year has gone by and many a night was spent cracking my head to crack the assembly code's secrets. All this would not have been possible without the help from many people in the community. Among whom, Kevin J Bezant's advice and tips were invaluable. Credit to TailFinn for starting this journey's first steps on 3rd August 2018! You showed me that it was possible to compile, link and to create a brand new FLIGHT.EXE. That inspired me to try my hand at modifying the existing cryptic 16-bit assembly language code. What a journey it has been for me! Thank you to Speedwagon for your kind words, inspiring thoughts and real-life pilot input into this project. Thank you to TomN for test piloting the modded FLIGHT.EXE and for getting me to remove trees from roads so that you can land your Tornado when no friendly runway presents itself. Thank you to ataribaby for showing interest in this project, enough to craft a mod for the Seitek analogue joystick. Thank you to mupf for getting the modded code on Github and for teaching me Githubese - how to clone, add, push and commit. 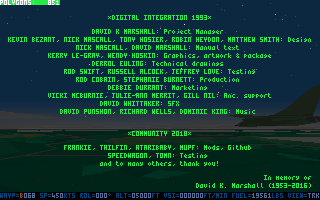 May the code one day be ported to C. Thank you to everyone who joined the Tornado Discord Server, and to all who contacted me via my email and via http://www.tornado2.com (aka http://www.moodurian.com) and http://www.moodurian.com/tornado. Also to Graeme Mason for his July 2018 writeup on Tornado in Games TM Magazine. If I have left out anyone, it is because there are too many to thank. A very special shoutout to Asid of Dogs Of War Virtual Unit for allowing me to host this Tornado modding journey and quest on the Dogs of War Virtual Unit forums. Cheers Mate. You rock. Braw, Bro. Description: Mod#58 is given a MAKEOVER. 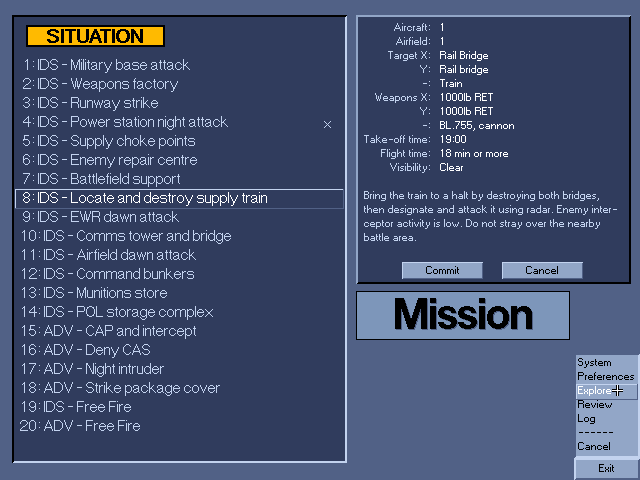 More importantly, with this mod, I have finally SOLVED a LONG-STANDING and PREVIOUSLY UNSOLVED problem of the dreaded "Airfield Strike" Training Mission. 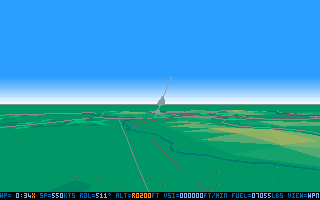 The solution involves placing the ETA (Estimated Time Of Arrival) to the Next Waypoint in the format of "MM:SS Waypoint Letter" at the bottom left corner of the screen's status bar. The problem that remains unsolved since 18th May 2018 was this: it would rear its ugly head whenever the gamer played the Training Mission "Airfield Atttack". Just as the Next Waypoint changes from "B" to "C", black vertical streaks will appear, spoiling the game! This was during the first incarnation of the visible waypoint mod. See here. At first I thought that this was due to too many variables being used, and too little memory left for the simulation to use. However, this was not the root cause of the black streaks. The cause of the problem was the WayPoint Letter itself! This was a very difficult problem to solve because it only appeared in that one training mission. 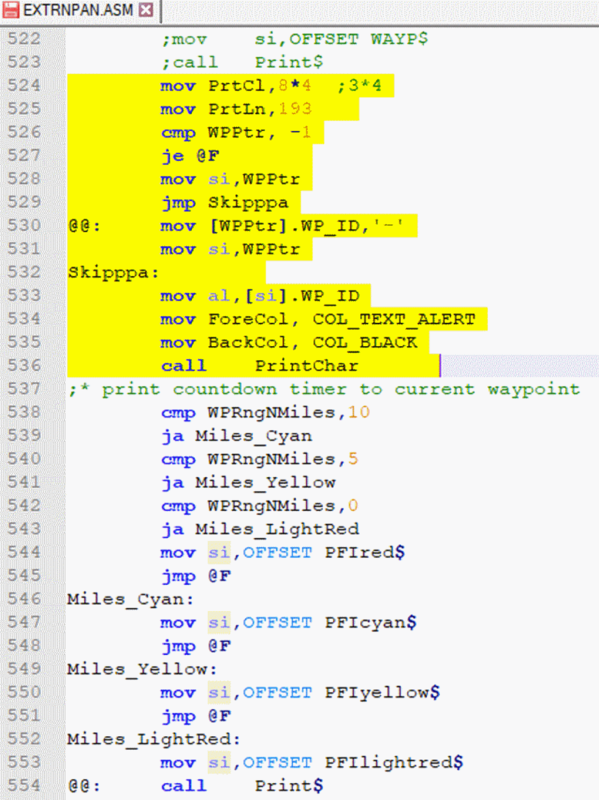 Furthermore, using various ohers means of code modifications resulted in the Waypoint Letter getting either corrupted or appearing in the wrong colour. Code soution shown below. This took me more than a week to solve. Now the black streaks no longer appear during the waypoint changeover. The screenshot below shows that the next Waypoint is C. This means that the changeover from Next Waypoint B to Next Waypoint C is, at last, glitch-free. 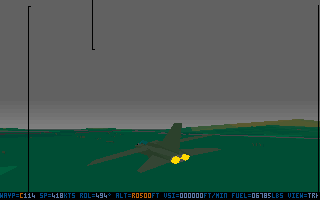 Now this latest FLIGHT.EXE makes the modded Tornado even more perfect and (hopefully) bug-free! 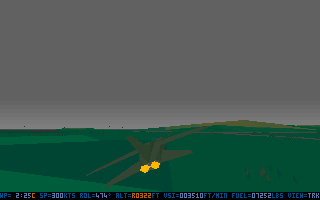 Note: The "Tornado Shadow" pseudo-mod doesn't quite qualify as a mod. Thus I am making the Credits mod as Mod#99 and this mod as 100th mod. A man's gotta do what a man's gotta do. Squash bugs. 101. Indirect ALARM plume when diving, is recreated in Tornado1.0a source code! Description: I managed to restore the flame plume of the Indirect ALARM missile. 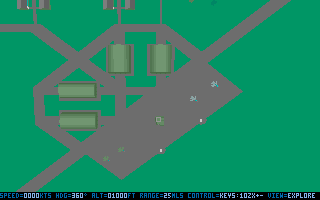 When Tornado was first released in 1993, it was the combat flight simulator with a dizzy array of weapons management and modelling features. 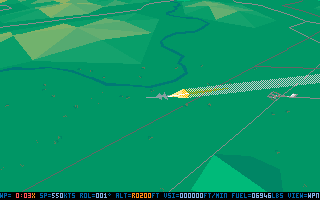 One of the best features of Tornado's weapons modelling was the Indirect mode ALARM. 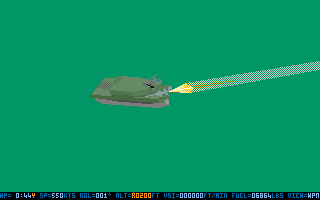 However, Tornado 1.0a had a bug in that the ALARM missile, in INDIRECT mode, did not animate its flame nozzle plume when diving towards the target. Tornado 1.0e's FLIGHT.EXE had this fixed - the plume of flame was present in the ALARM's dive. I always thought this feature was sorely missed in the modded Tornado. After all, the source code is Tornado 1.0a, the very first incarnation of Tornado. Now the flame plume is restored. As seen in this sequence of ALARM indirect mode screens! After not detecting any radar signals from a target, an ALARM climbs and gets ready to deploy its parachute. any faint RADAR signals from enemy AAA or SAM emplacements. RADAR detected! 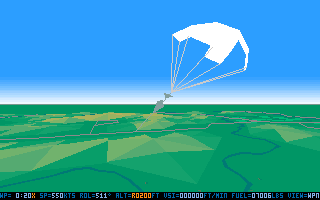 Parachute is discarded (this part is not animated). Then the ALARM's engine reignites and a long, bright and glorious flame plume is seen this time! Target microseconds from total destruction. Death from above from Indirect mode ALARM. It's nice to know that one of Digital Integraton's nicest features of Tornado - the Indirect mode ALARM - has been restored to its former glory in the latest modded FLIGHT.EXE file. Attached is the latest FLIGHT.EXE for your delectation and delight. Interesting, you are really following the developers' footsteps! Description: The flyby view now looks nicer. Granted, you have to first hit F1, then followup with F3. Nothing spectacular when you do this ... until you hit F1 again, followed by F3. The first time you hit F1, your Tornado is shown as the normal Tracking View. The second time you hit F1, your Tornado is 800 feet away. So when you hit the F3 key the second time, you will see a nice flyby effect. 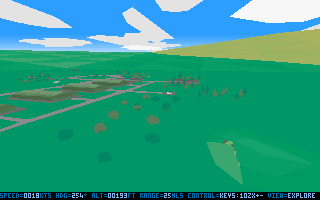 And the camera angle of the flyby view is randomised for variety! To get the effect again, hit the "F1 followed by F3" sequence as many times as you wish. If you wish to revert to the standard Tracking View where you can rotate around your Tornado, hit Ctrl+F1 instead of F1. Attached is the latest FLIGHT.EXE executable file. Enjoy.